Heat oven to 375°F (350°F for dark or nonstick pan). Line bottom only of 15x10x1-inch pan with foil or waxed paper; spray with baking spray with flour. Place paper baking cup in each of 8 regular-size muffin cups. In large bowl, beat eggs with electric mixer on high speed about 5 minutes or until thick and lemon colored. Add cake mix, water and oil; beat on low speed 30 seconds, then on medium speed 1 minute, scraping bowl occasionally. Pour 3 1/2 cups batter into pan. Divide remaining batter among muffin cups. Bake 14 to 16 minutes or until cake springs back when lightly touched in center and cupcakes test done when toothpick inserted in center comes out clean. If necessary, run knife around edges of pan to loosen cake. Turn cake upside down onto clean kitchen towel sprinkled with 1 tablespoon powdered sugar; carefully remove foil. While hot, carefully roll up cake and towel from narrow end. Cool completely on cooling rack, about 1 hour. Cool cupcakes 10 minutes. Remove from pan; cool completely, about 30 minutes. Save cupcakes for another use. Meanwhile, in medium microwavable bowl, microwave whipping cream uncovered on High 1 minute to 1 minute 30 seconds or until it just starts to boil. Stir in chocolate chips and corn syrup; let stand 3 minutes. Beat gently with wire whisk until smooth. Beat in vanilla. Refrigerate about 1 hour, stirring every 15 minutes, until spreading consistency. Unroll cake carefully, and remove towel. Spread filling evenly over cake; roll up cake. Place cooling rack on sheet of waxed paper. Place cake roll on cooling rack; frost cake. Using fork, drag tines through frosting to look like log. Let stand 15 minutes. Transfer cake to serving platter. Store loosely covered in refrigerator. Let stand at room temperature 30 minutes before serving. 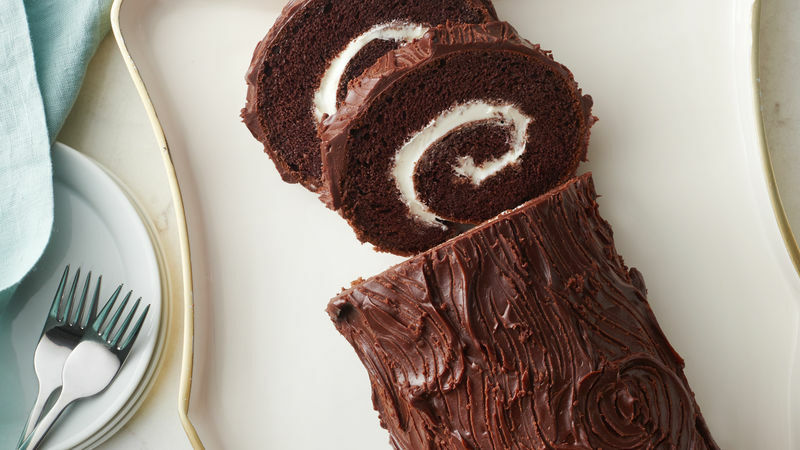 The right pan for making a cake roll is a rimmed 15x10x1-inch baking pan—sometimes called a “jelly roll” pan. Double-check the dimensions of what you have before making the cake batter. If your pan is a little smaller you’ll end up overfilling it your cake will overflowing in the oven, and if your pan is larger, the cake will bake up too thin. It’s important to prepare the pan so it will be easy work to remove the warm baked cake. Baking parchment, which is lightly waxed, is another option for lining the rimmed pan. It will easily peel off the bottom of the cake once you’ve turned it out onto the kitchen towel. Test the doneness of the cake by lightly touch the surface with your fingertip. When it springs back it’s done and should be removed from the oven. If the cake overbakes past this point, it won’t easily roll. Use a lint-free tea towel to roll up the cake. Its flat texture, coated with a fine sifting of powdered sugar, makes rolling up the warm cake super easy and prevents any sticking or cracking once the cake is cool. The towel will also be your best friend for rerolling the cake once it’s filled. Double the recipe for the Rich Chocolate Frosting and freeze half of it with the cupcakes. Pull out the frosting and cupcakes to make an impromptu dessert over the holidays. Slice the top off of each cupcake and sandwich them with the frosting—finish them off with a generous dollop of snowy whipped cream and a sprinkling of toasted sweetened coconut. For a garnish, brush cranberries with water and roll in coarse white or gold sugar. Add fresh mint leaves. The elegant chocolate yule log cake is a holiday must-have in many French-speaking parts of the world. It’s designed to resemble a yule log, which was a specially selected log that was burnt as a Christmas tradition throughout Europe. It’s one of the oldest existing Christmas traditions, in fact, since its first mention was recorded in 1184. The log cake recipe is an emblem of that tradition, and it's been baked by home cooks and professionals since the 18th century. It's traditionally served with one end cut off, and with “bark” created by pulling the tines of a fork through the chocolate yule log cake icing. You can get even more creative by adding flaked coconut or powdered sugar “snow” to the base of your yule log cake, or by including holly sprigs, fir tree branches, fresh berries or “mushrooms” made of meringue or marzipan. If you’d like to learn about even more cake recipes—from plain to fancy—check out Betty's best cake recipes.